Want to make sure your next family vacation is a real splash? Take your family for a cool and educational adventure at the Atlanta Aquarium . Some people call aquariums "the new zoos" and without a doubt, they are some of the hottest lures. The recently opened Atlanta Aquarium was created to draw visitors to the city. Developed in part by the city of Atlanta, this titanic aquarium draws in travelers, who are then enticed to visit other destinations within the downtown entertainment zone. The original idea for opening the Atlanta aquarium, also known as Georgia Aquarium, was developed by Bernie Marcus. In November 2001, Mr. Marcus announced his plans to donate the funds required to build an aquarium in downtown Atlanta. From that idea, the Atlanta Aquarium was born. The Atlanta Aquarium is a half-million square foot facility housing, more than 100,000 animals in 8 million gallons of fresh and salt water. From project groundbreaking to the grand opening, the entire construction process took only 27 months to complete. 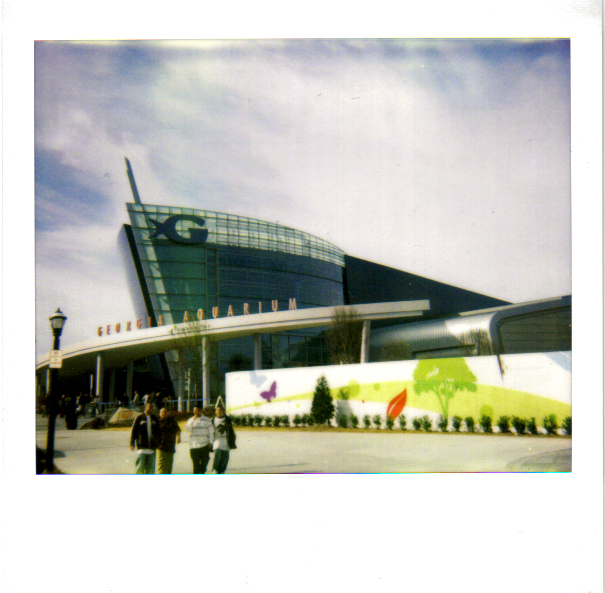 The Atlanta Aquarium is located on 9 acres of land adjacent to the Centennial Olympic Park in the downtown area. When you visit the Atlanta Aquarium, you'll notice the unique appearance of the building's exterior. The facilities were designed to look like a giant ship breaking through a wave. As visitors move forward to the large atrium inside the building, they are led into the facility by "a wall of fish" guiding them inside. Once inside, guests are given the option to choose from five main galleries. Each gallery is easily distinguishable with a sign and icon at the entrance. Tropical Diver -- with two video screens representing fish on a reef. After visiting each exhibit, guests return to the main atrium to visit the next gallery. Visitors to the Atlanta Aquarium will enjoy about 60 habitats through 12,000 square feet of viewing windows. The windows are made of a durable acrylic with a total weight of 328 tons. The largest of the habitats is a massive 263 feet long by 126 feet wide, with a depth of 33 feet. This giant carries 6.2 million gallons of water. This display, specially designed as a habitat for whale sharks, is also home to tens of thousands of other animals that commonly thrive amid coral reefs and open ocean waters. As you continue to explore the Atlanta Aquarium, you'll find a 100-foot long tunnel and one of the world's largest aquarium windows, giving a glimpse into the whale shark habitat. The second of the largest habitats in the Atlanta Aquarium, it holds 800,000 gallons of water and was specifically developed to simulate the natural habitat of beluga whales. Anyone with an interest in nature and oceanic life will marvel at the Atlanta Aquarium . Spend the day viewing 100 thousand creatures representing 500 species from around the globe living in over 8 million gallons of fresh and salt water. The Atlanta Aquarium is a true ocean jewel, right in the middle of Georgia.